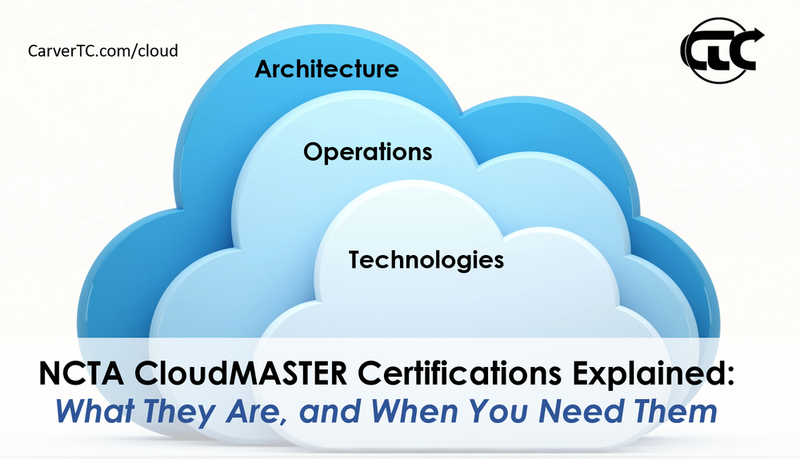 Since we added the CloudMASTER certification training classes to our class schedule, we've been getting a lot of questions about the CloudMASTER certifications themselves. IT pros and IT managers want to know what the different certifications are, how the certifications map to different points in an IT career, and about the overall CloudMASTER certification track. So in this article I'll break it all down for you. Let's get started. This certification is about getting to the cloud. It tests general knowledge of cloud computing terms, technologies, and trends. It also tests on how to address common barriers to cloud computing adoption such as application migration issues, and cultural resistance. This certification also requires knowledge of common security, privacy, and technical concerns, such as vendor lock-in. Things that must be planned for prior to migrating to the cloud. To pass the certification you have to demonstrate that you can evaluate cloud Software as a Service (SaaS) solutions, and implement a number of free, and paid SaaS solutions for business including email, marketing, CRM, and others. You also need to show detailed knowledge of how to migrate email from on-premises to the cloud, including solution evaluation, migration planning, and execution. You will also be tested on your ability to integrate cloud solutions from multiple vendors. Finally, this exam tests fundamental knowledge and use of Platform as a Service (PaaS), and Infrastructure as a Service (IaaS) solutions. Get 10% off a CloudMASTER class for 3 or more attendees for a limited time. Click for details. This certification is really for any system administrator or IT application support staff with six months to a years worth of experience. If you're a system or application admin, this certification is a great step that can help you prove you know and understand the most fundamental issues around migrating to cloud solutions. The associated training class not only prepares you for the certification, but also gives you knowledge of cloud computing trends and issues, and prepares you to define selection criteria for cloud solutions, then evaluate and make selections based on those criteria, while addressing security, privacy, interoperation, and other concerns. That knowledge will help you bring thoughtful insights to any discussion of cloud service adoption. It will help you stand out planning and migration discussions, and point out common pitfalls and potential alternative solutions to the benefit of your organization. The certification will provide proof that you know these topic areas, and that you're on the path to becoming a certified CloudMASTER. This certification is about administering, and orchestrating cloud services across multiple platforms once your organization is in the cloud. It tests skills for provisioning, deploying, maintaining, and troubleshooting Platform-as-a-Service (PaaS) and Infrastructure-as-a-Service (IaaS) solutions. This wide ranging exam tests your knowledge of how to implement and manage servers and virtual machines in the cloud. You will also have to show the ability to manage security and compliance in the cloud. The exam tests your knowledge of deploying websites and applications in Amazon Web Services (AWS), Microsoft Azure®, Rackspace Cloud, DigitalOcean®, and Heroku®. You must also demonstrate management and orchestration of cloud services using Opscode Chef and Puppet. Finally, you have to show strong, detailed knowledge of how to plan, and executive a phased cloud migration. Everything covered in the exam, is covered the NCTA Cloud Operations course, which provides hands on, active learning, with the platforms and tools tested in the certification! This certification is for system administrators who are, or will be managing servers and applications in a cloud computing, or hybrid environment. This certification proves you've worked with a variety of cloud vendor platforms and services, and are familiar with performing common cloud system and service administration tasks, as well as application deployments on a number of cloud services. Beyond that it shows that you know how to select and use cloud orchestration tools to automate administrative tasks for efficiency and administrative scalability. This certification and class is an excellent fit for any cloud system administrator who wishes to get a broader view and more experience with a broader range of cloud service providers. Passing this certification proves that you've been there, and done that on the platforms, and with the services listed above. That knowledge and experience will help you compare and contrast cloud solutions, and provide valuable input on cloud service provider, and tool selection, as well as post deployment orchestration, and maintenance topics. This certification is about designing a cloud architecture to meet business needs, from discovery to design, to presenting the plan to executives or clients. This certification builds off of the previous two, bringing in everything you've learned, and adding the fundamental steps of discovery and analysis to determine technical requirements, barriers, and concerns for moving to the cloud. The certification tests your ability to assemble a team to perform the migration including setting roles, and objectives. The exam tests your ability to assemble the right cloud components to meet those technical requirements and design a scalable solution. In addition, it tests your ability to evaluate service level agreement, determine licensing requirements, and perform cost comparisons. The exam also covers design solutions that provide secure access to information, and that secure data both in transit and at rest, while ensuring business continuity and disaster recovery. The exam also tests your ability to estimate total cost of ownership, and return on investment for cloud solutions. Finally, the exam covers how to prepare a project plan, and how to present it effectively to get sign off from upper management or clients. Everything covered in the exam, is covered the NCTA Cloud Architecture course, which provides hands on, active learning, with the platforms and tools tested in the certification! This certification is for system administrators who wish to plan, design, and secure cloud computing solutions to meet a variety of application, and organizational requirements. This certification takes it to the next level, and proves you can operate independently to evaluate application and organizational IT needs, and design cloud computing solutions to meet those needs. It demonstrates that you have the skills to address security, privacy, business continuity, disaster recover, and vendor lock-in issues in your design and implementation plans. It also proves that you can create a team to facilitate a cloud migration, and distribute tasks to maximize efficiency. Finally, it demonstrates your ability to document, and present cloud solutions to executives which is an invaluable skill for interfacing with "C-suite" personnel in any organization. Either to get cloud solutions approved, or to sell cloud consulting services to clients. The knowledge and skills gained in the training, will help you speak to core elements of the design processes including component comparison, and selection, creating costs comparisons, developing total cost of ownership and return on investment projections. Those skills will help you lead cloud migration teams, and provide consulting support for any organization transitioning to cloud services. This one's easy. If you pass all three exams you're a certified CloudMASTER! Want to move fast? Think you're ready to do this now? Aren't afraid of hard work? Consider our NCTA Cloud Bootcamp course. We cover all three courses in two weeks and help you prepare for you certification exams. If you want to get started, check out our class schedule to see the full course description, and run dates for all three of the cloudmaster cloud computing classes. If you are unsure about which course you or your team should take, reach out. Depending experience, roles, and responsibilities, different team members make require different classes, or your organization may benefit from a custom class. Take a look at the courses linked, and contact us. We'll tell you which course or courses can best meet your organization, and personal needs, and answer any questions you might have. CarverTC provides CloudMASTER cloud computing classes and certification preparation in the Portland Oregon area and across North America.